Stays on your horse with the double-latch closure stablemates can't rip off! It fastens twice for double security. The double-latch closure is located under the jaw, not on the cheekbone, making it harder for other horses to reach. Keeps flies, dust, dirt and debris away from your horse's eyes. 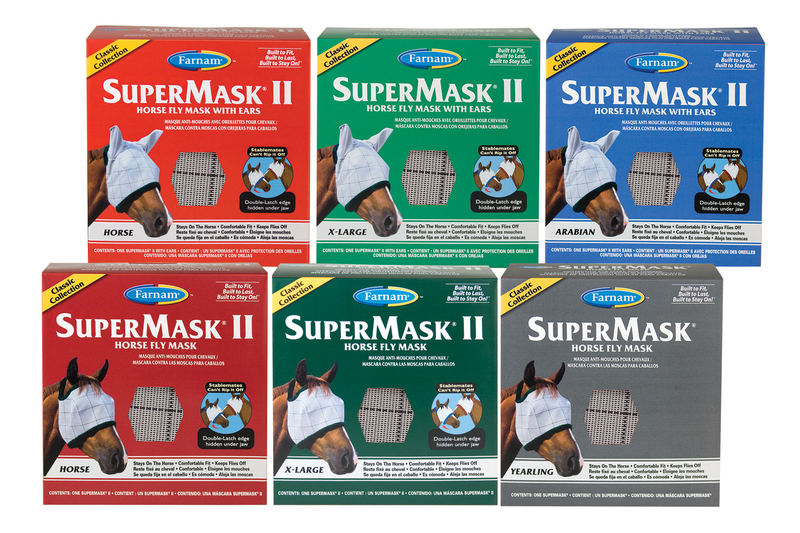 Protects your horse's eyes and face from harmful UV rays and aids in healing after eye injuries. The see-through mesh does not obstruct vision. Plush, flyproof trim keeps flies out, providing maximum comfort without rubbing or harsh abrasion. Available with or without ears. Available in Horse, XLarge, Yearling, Foal and Mini without ears and in Horse, XLarge and Arabian with ears. Also available is the Shimmer Weave® Mesh Color Collection which combines function with fashion in 4 color combinations designed to reflect your horse's natural color. Available in Horse, XLarge and Arabian without ears and Horse and XLarge with ears. This product is offered in 8 packages. Start with throat latch open. 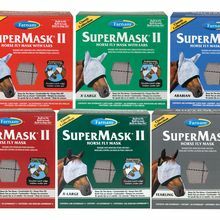 Grasp top of mask at ear and forelock opening (for mask with ears, grasp fur at top of mask nearest ears) and gently pull down over horse's ears. Reach under horse's neck and bring the right side of the throat latch over to meet the left side of the closure. The left side of the closure then folds back over to secure closure of the throat latch. Attach snugly, then check for comfort and safety. Adjust if necessary.